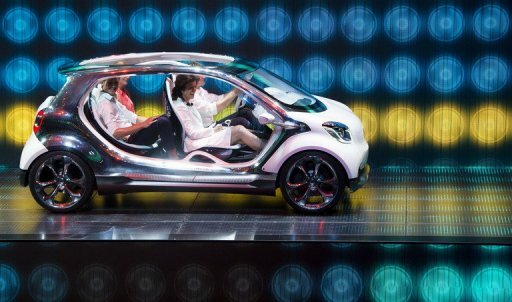 The new Smart four joy is presented at the Mercedes booth during the IAA automobile show in Frankfurt, on September 9, 2013. According to the organiser, more than 1,000 exhibitors from 35 countries will present their products. FRANKFURT, (AFP) – (AFP) – Electric cars by German builders are just some of the nearly 70 world premieres at the 65th edition of the IAA auto show opening later this week. German premium maker BMW has an entire hall to itself where pride of place will be given to the new i3, its first-ever fully electric model with a driving range of between 130-300 kilometres (80-186 miles) which is scheduled to hit Europe’s showrooms in November. Another hotly awaited model at the show, opening in Frankfurt on Thursday, will be BMW’s plug-in hybrid, the i8. The Munich-based group will also present the definitive version of its new Series 4, the coupe version of its Series 3 limousine and the x5 eDrive prototype, a plug-in hybrid take on its x5 SUV. Volkswagen, Europe’s biggest car maker, is also going electric with its first fully electric models, the e-Golf and the e-Up!. The e-Golf, with a driving range of 190 kilometres, will hit the roads from the beginning of next year. The e-Up!, a four-seater with a starting price of 26,900 euros ($35,490) and a range of 160 kilometres, will go on sale in Germany in October. VW will also show off its Golf R, a revved-up 300 horse-power version of its perennial Golf. Mercedes-Benz is looking to draw the crowds with its concept S-Class Coupe and a third version of its A-Class — the compact sports SUV which is a rival to Audi Q3 and the BMW X1. Smart is set to unveil a prototype of its door-less four-seater FourJoy, while Opel is hoping to create a buzz with its Monza concept car, a hybrid intended to lead the way for the brand-new style of the group’s upcoming models. SEAT, the Spanish arm of the VW group, will unveil its new Leon ST estate car to be launched in November. And VW’s Czech brand Skoda will show off a compact model of its Rapid family car, the Rapid Spaceback. Sports car enthusiasts can gape in wonder at the Lamborghini Gallardo LP570-4 Squadra Corse, a limited edition with 570 horse-power, or the hybrid Porsche 918 Spyder with close to 900 horse-power under its bonnet. Renault will lift the lid on a new concept car that will prefigure the successor of its Espace mini-van model in the form of a top-of-the-range crossover. The French group’s efforts in this field are being closely watched following the failure of its VelSatis and Avantime models. Renault is also going to unveil a new generation of the Dacia Duster compact SUV. Citroen last week unveiled its Cactus concept car which prefigures its new range of budget vehicles. Peugeot is coming to Frankfurt with a new version of its 308 that will rival VW’s Golf 7. Swedish group Volvo, owned by China’s Geely, will show off a concept coupe and Fiat of Italy will lift the veil on its 500X, a crossover version of its 500 model.